Think your engine is the only thing you should monitor? You should also consider the nut behind the wheel! 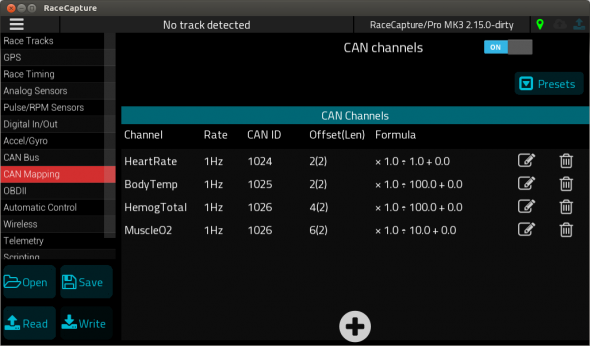 The driver is arguably the most important part of the equation, and now we’ve integrated Wireless Motorsports BioTelemetry system as a CAN preset. Thank you Peter Krause for supplying the necessary CAN bus information! To start, just go into Setup / CAN channels and press the Presets button. Then, press the cloud update button to get the latest presets. 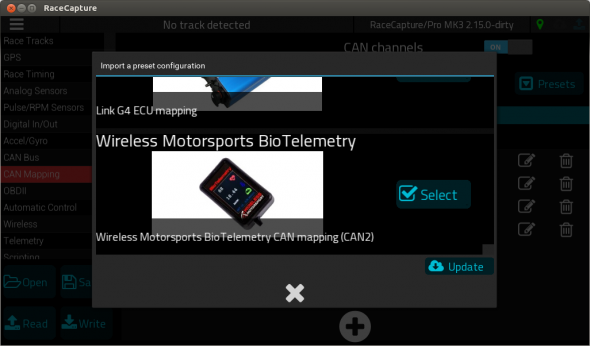 Select the Wireless Motorsports BioTelemetry preset and it will be added to your list of CAN mapped channels – ready for logging or broadcast in real time to Podium. This preset is defaulted to CAN2, but can be changed to CAN1 by editing each channel. Be sure to also set the CAN bus to 1MB to match the baud rate of the BioTelemetry device – this can be set under Setup/CAN Bus. Once you have it mapped and connected, you will be able to see the driver biometrics along side all of your other sensor data. Got another sensor or system we should support? Let us know in the comments what other system we should integrate – we’ll take a look at it!